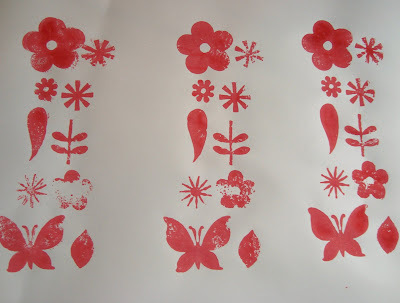 I was inspired to try to create an easy pattern block by Lena Corwin's, Printing by Hand, one of my favorite resources. I haven't done the adult version yet, but I'm loving doing it with children. It was the perfect lesson in pattern design for both my daughter and myself. We started with pre-cut shapes. When the idea was firmly grasped, my daughter jumped in and cut her own shapes. 1. Arrange your shapes on board. 2. 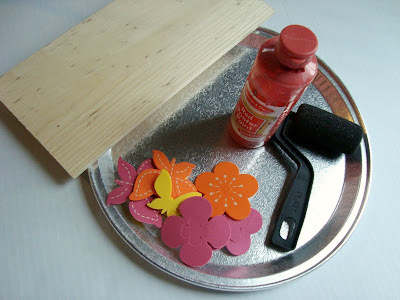 Squeeze a line of paint on cookie sheet. 3. Run roller through paint until evenly coated. 4. Roll paint over raised surface of stickers (may need to help your child, especially the first time) until completely coated. 5. 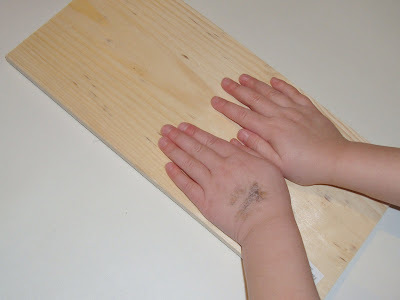 Carefully (we talked about using both hands) turn block onto paper. 6. Press with palms of hands around the entire surface, being careful not to dislodge from original spot. Poster paint (we used Melissa and Doug's) tends to stick to the paper and keeps it from shifting, unlike stamp pad ink.This makes for little smearing and happy artists! 7. 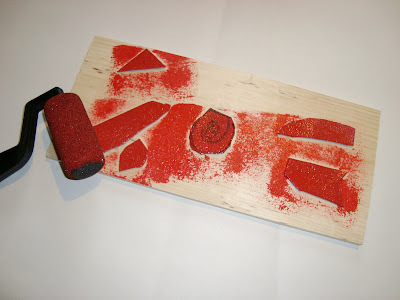 Gently peel block away from paper. 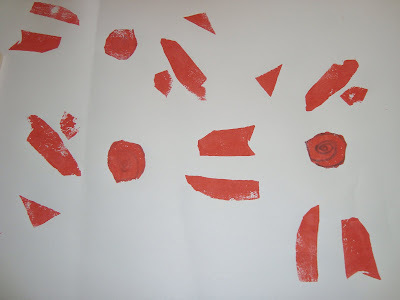 To create her own shapes, my daughter cut out designs she had drawn directly onto a foam sheet. After she arranged them on her wood block, I hot glued them into place. This is such a fun idea! Thanks! Maya, I feel like we're all reversed now! Last summer you sent me such nice comments about parenting and creativity, longing to really get started w/ blogging and teaching creatively- now that I'm finishing up my busy work for the school year, I'm reading your blog posts with yearning to be more creative and do fun artsy things with my boy. You are inspiring, my dear! How great, I wish my niece was old enough to do this (she just turned two). Do you have any recommendations for stamping onto fabric? Seems like paint would produce nicer results than a stamp pad, but I'm not sure about the texture. This is awesome!!! Definetly on my list to try with the kids. Thanks for sharing. What a super great idea! There are so many of those foam shapes out there...the possibilities are endless! Thanks for sharing!!! When are your art classes for chldren starting up at the barn? You are such a beautiful creative force in the land of motherhood. What a fun project Maya, I love it! I'll be linking. 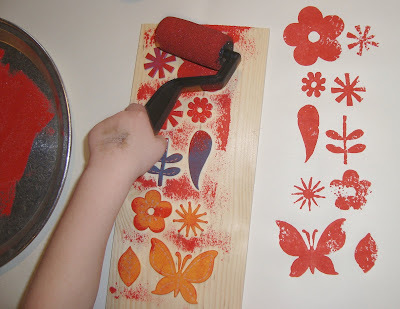 I was looking for a way to stamp with my 2.5 year old and this will be a perfect start. I've been a reader for a while--thanks for continuing to inspire my whole family. I really like the way the pattern comes out - and from such a simple set of supplies. I made a super-quick heart stamp like this, years ago, and I'd completely forgotten. Thanks for the lesson. How old is the child who did this with you? I'd like to try it with my grandkids who are 4 1/2. You think? They are used to doing art projects with me. 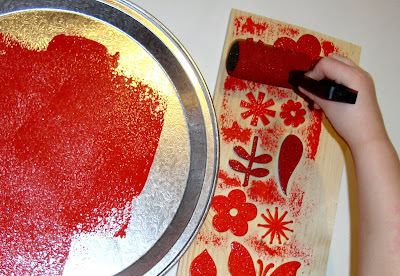 SUCH a great post, and timely for me, as I just dusted off my linoleum block printing supplies--which have sadly never been used. I'm determined to make Easter cards. I LOVE your kid-friendly technique! What a great idea..I am going to try this with my kids this weekend. Lynn- my daughter is 4... your grandchildren will have so much fun! Pascale- you know me too well... child-designed curtains, clothing, bedding... so many ideas for cloth stamping! Thanks everyone! Sounds like many of you want to give it a try. I'd love to see what your children come up with. You can upload the photos to the maya*made flickr group to share your designs. These are very fun and love the idea of kid designed fabric. 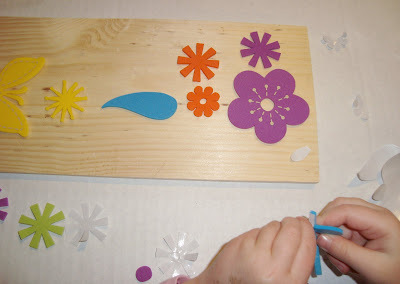 You should also try making "string stamps" (if you don't already have that trick up your sleeve) You use a heavier string...think hardware store stuff...(not sure how yarn would work, but maybe) and glue it down on a wood block or thick cardboard in a pattern or on an outline of a simple drawing, let dry then it is a very kid friendly stamp. They love these. Oh Maya I can't tell you how lucky you are to have your little pj girl home with you. Posts like this make me yearn for more pajama days. Aren't you happy you are blogging it all. What a nice reminder of simple pleasures you will have. You need to do one of those "blog books" if you haven't already. She's done a gorgeous job Maya. Oh my! This is just so fabulous! Love every little thing about it. Love it! I've been creating my own stamps after being inspired by Lena's book last summer, and have just started involving my 5-year-old daughter. We're trying to decorate some baby onesies for several friends who are due soon. But I love the pre-cut foam piece idea for her. Another excellent "how to" Maya. Your creativity never ceases to amaze! Thanks for sharing this inspiring project! I think it's great that you can introduce a very young child to a fundamental principle of design--pattern--in such a fun and satisfying way. And how fun that your daughter was able to make her own wrapping paper (?). I look forward to your further stamping experiments! What a great idea! I have oodles of these foam shapes and never ever thought to use them as stamps. Definitely trying this one out with the kiddos on the next rainy day! Thanks!! Hi, this is the first time I come here and I am surprised and enchanted. This idea is amazing! I loved it. I recently picked up the supplies and can't wait to try this with my daughter - I'm thinking wrapping paper, using our big art paper roll. Thanks for the inspiration, and I hope by sharing the link, others will be inspired too!